A beautiful blue sky in London. Yes, despite my rantings about the never ending grey skies, blue can happen. 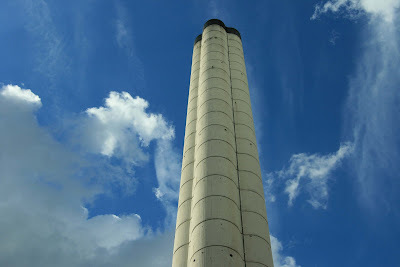 This towering chimney is near the Brunswick centre. I searched everywhere for a sign or some indication as to what its purpose is, but found nothing. It seems to sit in a well of water. Maybe some Londoners can tell us what it is for. Now that is a blue to talk about! Stunning! I'm glad this blue floated in for you! That's a stunning shot. The chimney stack againgst the sky is very impressive. beautiful sky and nice angle. It would be interesting to learn what it is for. But it makes a great picture, doesn't it? And a beautiful blue sky in London after all. I love blue skies. We get a lot of them around here but I still love its vividness. And this one is one attractive photo. Skies looked like pastel paint, or maybe oil. Cool. Excellent Image! Thank you for sharing and Cheers, Klaus ! Oh wow, what a photo. I think its my favourite of the day! what a fabulous looking sky! is it really happening in london!?!? a simple and beautiful composition, Mo! Stunning photo! I guess a blue sky is worth the wait. This is a wonderful architecture and sky combination, and a realy good blue one.